All manuscript should conform to the Uniform Requirements for Manuscripts Submitted to Biomedical Journals, as reported at http://www.icmje.org/icmje-recommendations.pdf. Manuscripts should be written in English. Contributors who are not native English speakers are strongly advised to ensure that a colleague fluent in the English language or a professional language editor has reviewed their manuscript. Concise English without jargon should be used. Repetitive use of long sentences and passive voice should be avoided. It is strongly recommended that the text be run through computer spelling and grammar programs. Either British or American spelling is acceptable but must be consistent throughout. The Current Thoracic Surgery is published three times annually. Authors should certify that neither the manuscript nor its main contents have already been published or submitted for publication in another journal. This includes symposia, transactions, books, articles published by invitation, posting in electronic format and preliminary publications of any kind except an abstract of 400 words or fewer. Manuscripts may be rejected without peer review by the editor-in-chief if they do not comply with the instructions to authors or if they are beyond the scope of the journal. Three or more reviewers (including international peer reviewers) are assigned for each article and acceptance is based on significance, originality, and validity of the presented material. Due to the Current Thoracic Surgery journal’s double-blinded review principles, the names of the authors and reviewers are not known to the other. If the article is accepted for publication, editorial revisions may be made to aid clarity and understanding without altering the meaning. After a manuscript has been accepted for publication, i.e. after referee-recommended revisions are complete, the author will not be permitted to make changes that constitute departures from the manuscript that was accepted by the editor. Before publication, the galley proofs are always sent to the authors for corrections. Mistakes or omissions that occur due to some negligence on our part during final printing will be rectified in an errata section in a later issue. This does not include those errors left uncorrected by the author in the galley proof. The Journal has adopted the “open access policy” by considering the principle increasing the global exchange of the knowledge that generates useful results for humanity. 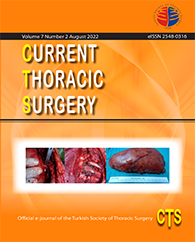 Current Thoracic Surgery is an "open access journal” the content of which is available to all users freely. Users can read the articles in full text, download, issue, print out and link to articles citing the journal without taking permission from the publisher or the author(s). The copyright transfer form, which can be found at web site must be signed by the corresponding author on behalf of all authors and must accompany all papers submitted. Please see the form for additional copyright details. After a manuscript has been submitted, it is not possible for authors to be added or removed or for the order of authors to be changed. If authors do so, their submission will be canceled. The authors confirm that they have complied the scientific, ethical standards and responsibilities, in doubt editors would have no responsibility. Approval by the local institutional human research committee according to Helsinki Declaration is obligatory for experimental, clinical and drug researches. Informed consents from participants should be obtained and these two points should clearly be declared in the ‘’Materials and Methods’’ section. Also include an affirmation that informed consent was obtained from each participant. Include the date and number of approval by the local institutional human research committee and the ethical guidelines that were followed by the investigators. All papers reporting animal experiments should include a statement in ‘’Materials and Methods’’ section giving assurance that all animals have received humane care in compliance with the Guide for the Care and Use of Laboratory Animals and indicating for the approval by the institutional ethical review board. If necessary, a copy of the form could be required by the editor. Similarly include the date and number of approval by the local institutional animal research committee and the ethical guidelines that were followed by the investigators. The Current Thoracic Surgery is electronic peer reviewed international journal committed to upholding the possible highest standards of publication ethics. In order to provide our readers with a journal of highest quality we state the following principles of Publication Ethics and Malpractice Statement. All articles not in accordance with these standards, will be removed from the publication if malpractice is discovered at any time even after the publication. The Current Thoracic Surgery is checking all papers in a double-blind peer review process. We also check for plagiats and research fabrication (making up research data); falsification (manipulation of existing research data, tables, or images) and improper use of humans or animals in research. In accordance with the code of conduct we will report any cases of suspected plagiarism or duplicate publishing. The Current Thoracic Surgery reserves the right to use plagiarism detecting software to screen submitted papers at all times. Conception or design of the experiment(s), or collection and analysis or interpretation of data; Drafting the manuscript or revising its intellectual content; and Approval of the final version of the manuscript to be published. Reviewers evaluate manuscripts based on content without regard to ethnic origin, gender, citizenship, religious belief or political philosophy of the authors. They must ensure that all the information related to submitted manuscripts is kept as confidential and must report to the Editor-in-Chief if they are aware of copyright infringement and plagiarism on the author’s side. They must evaluate the submitted works objectively as well as present clearly their opinions on the works in a clear way in the review form. A reviewer who feels unqualified to review the research reported in a manuscript or knows that its prompt review will be impossible should notify the Editor-in-Chief and excuse himself from the review process. The use of someone else’s ideas or words in their original form or slightly changed without a proper citation is considered plagiarism and will not be tolerated. Even if a citation is given, if quotation marks are not placed around words taken directly from another author’s work, the author is still guilty of plagiarism. Reuse of the author’s own previously published words, with or without a citation, is regarded as self -plagiarism. 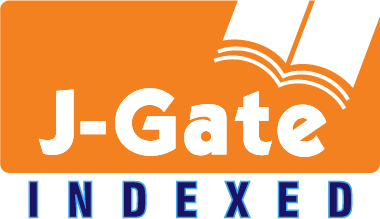 All manuscripts received are submitted to iThenticate®, a plagiarism checking system, which compares the content of the manuscript with a vast database of web pages and academic publications. Manuscripts judged to be plagiarized or self-plagiarized, based on the iThenticate® report or any other source of information, will not be considered for publication. So authors should declare that there is no conflict of interest and also, if there is any, the status for their financial support should be clear in the cover letter and within article. The authors should describe the role of the study's sponsors in the following areas: a. designing the study, b. collecting, analyzing, and interpreting the data, c. writing the report. The statistical method used should be reported in a way that a reader whoever could reach the original data could understand the results. The terms used, abbreviations, symbols, the pc programme used and the statistical method should all be defined. When reporting the results, especially when giving means and percentages, two digits should be given after the comma (112.20 or 112.21 instead of 112.2). P, t, Z values are exceptional and three digits should be given after the comma (p=0,001, instead of p<0,05). Briefly, except whole numbers, two digits after the comma should be given, but for statistical values like p,t,z,F,Chi-square, three digits after the comma should be given. When presenting p values, the exact p value together with the test statistics should be given, except for the case when this value is smaller than one percent or one per thousand (this time p<0.01 or p<0.001, respectively should be given). The Current Thoracic Surgery requires authors to disclose in the “cover letter” any commercial association (eg, employment, direct payments, stock holdings, retainers, consultantship, patent licensing arrangements, or honoraria) that might pose a conflict of interest issue concerning the manuscript. All funding sources supporting the work should be acknowledged in a footnote. Also authors should mention that none of the material in the manuscript has been published previously, and that none of this material is currently under consideration for publication elsewhere. This includes symposia, transactions, books, articles published by invitation, and preliminary publications of any kind except an abstract of 400 words or fewer. Manuscripts should be double-spaced with 3-cm margins on all sides of the page, in Times New Roman font. Every page of the manuscript, including the title page, references, tables, etc., should be numbered. All copies of the manuscript should also have line numbers starting with 1 on each consecutive page. In general, the journal follows the conventions of Scientific Style and Format, The CSE Manual for Authors, Editors, and Publishers, Council of Science Editors, Reston, VA, USA (7th ed.). If symbols such as ×, μ, η, or ν are used, they should be added using the Symbols menu of Word. Degree symbols (°) must be used from the Symbol menu, not superscripted letter o or number 0. Multiplication symbols must be used (×), not the letter x. Spaces must be inserted between numbers and units (e.g., 3 kg) and between numbers and mathematical symbols (+, –, ×, =, <, >), but not between numbers and percent symbols (e.g., 45%). Please use SI units. All abbreviations and acronyms should be defined at first mention. Latin terms such as et al., in vitro, or in situ should not be italicized. Research articles should be divided into the following sections. Principal sections should be Introduction, Materials and Methods, Results, Discussion, Acknowledgements and References sections. Please see below for information about other types of manuscripts. The first page should contain the full title in sentence case, the full names (last names fully capitalized) and affiliations (in English) of all authors (University, Faculty, Department, City, Country), and the contact address and e-mail for the clearly identified corresponding author. An informative abstract of not more than 250 words must accompany each manuscript. The abstract must be structured to include the study’s background, materials and methods, results, and conclusions and key words under 5 separate headings. Abstracts of review articles should be a brief overview of the main points from the review. Please provide at least 3 key words or phrases to enable retrieval and indexing. Acronyms should be avoided. Always try to use terms from the Medical Subjects Headings (MeSH) list from PubMed https://www.ncbi.nlm.nih.gov /pubmed. Explain clearly but concisely your clinical, technical, or experimental procedures. Previously published papers related to the methods should be cited with appropriate references. Brand names and company locations should be supplied for all mentioned equipment, instruments, chemicals, etc. Findings must be described without comment. The same data or information given in a Table must not be repeated in a Figure and vice versa. It is not acceptable to repeat extensively the numbers from Tables in the text or to give lengthy explanations of Tables or Figures. Statements from the Introduction and Results sections should not be repeated here. The final paragraph should highlight the main conclusions of the study. Names of funding organizations should be written in full. Journal titles should be abbreviated according to ISI Web of Science abbreviations. Authors are solely responsible for the accuracy and completeness of references. Özpolat B, Gürpınar ÖA, Ayva EŞ, Gazyağcı S, Miyaz M. The effect of Basic Fibroblast Growth Factor and adipose tissue derived mesenchymal stem cells on wound healing, epithelization and angiogenesis in a tracheal resection and end to end anastomosis rat model. Turk Gogus Kalp Dama 2013; 21: 1010-9. All illustrations (photographs, drawings, graphs, etc. ), not including tables, must be labeled “Figure.” Figures must be submitted both in the manuscript and as separate files. All tables and figures must have a caption and/or legend and be numbered (e.g., Table 1, Figure 2), unless there is only one table or figure, in which case it should be labeled “Table” or “Figure” with no numbering. Captions must be written in sentence case (e.g., Macroscopic appearance of the samples.). The font used in the figures should be Times New Roman. If symbols such as ×, μ, η, or ν are used, they should be added using the Symbols menu of Word. All tables and figures must be numbered consecutively as they are referred to in the text. Please refer to tables and figures with capitalization and unabbreviated (e.g., “As shown in Figure 2…”, and not “Fig. 2” or “figure 2”). The tables and figures themselves should be given at the end of the text only, after the references, not in the running text. The resolution of images should not be less than 118 pixels/cm when width is set to 16 cm. Images must be scanned at 1200 dpi resolution and submitted in jpeg or tiff format. Graphs and diagrams must be drawn with a line weight between 0.5 and 1 point. Graphs and diagrams with a line weight of less than 0.5 point or more than 1 point are not accepted. Scanned or photocopied graphs and diagrams are not accepted. Charts must be prepared in 2 dimensions unless required by the data used. Charts unnecessarily prepared in 3 dimensions are not accepted. Figures that are charts, diagrams, or drawings must be submitted in a modifiable format, i.e. our graphics personnel should be able to modify them. Therefore, if the program with which the figure is drawn has a “save as” option, it must be saved as *.ai or *.pdf. If the “save as” option does not include these extensions, the figure must be copied and pasted into a blank Microsoft Word document as an editable object. It must not be pasted as an image file (tiff, jpeg, or eps) unless it is a photograph. Tables and figures, including caption, title, column heads, and footnotes, must not exceed 16×20 cm and should be no smaller than 8 cm in width. For all tables, please use Word’s “Create Table” feature, with no tabbed text or tables created with spaces and drawn lines. Please do not duplicate information that is already presented in the figures. Tables must be clearly typed, each on a separate sheet, and double-spaced. Tables may be continued on another sheet if necessary, but the dimensions stated above still apply.